Pasco, one of the Tri-Cities along with Kennewick and Richland, sits at a watery crossroads on the Columbia River between the mouths of the Snake and Yakima rivers. The city was established in 1885 and incorporated in 1891, but was an important area of human habitation for almost 10,000 years. Many tribes fished and wintered in the flats along the Columbia at the mouth of the Snake. The Lewis & Clark Expedition camped at the site in 1805 and 1806, and reported that Indians gathered there in great numbers. Ainsworth, a town established near the mouth of the Snake in 1879 as a construction camp for the Northern Pacific Railway, was Pasco's precursor. Once construction was finished, Ainsworth was dismantled and many buildings moved just a few miles up the Columbia to the newly established Pasco, which was designated as the new railroad division point. Pasco continued to be an important railroad and steamboat hub. With the coming of irrigation near the beginning of the 1900s, Pasco soon developed into an agricultural center. 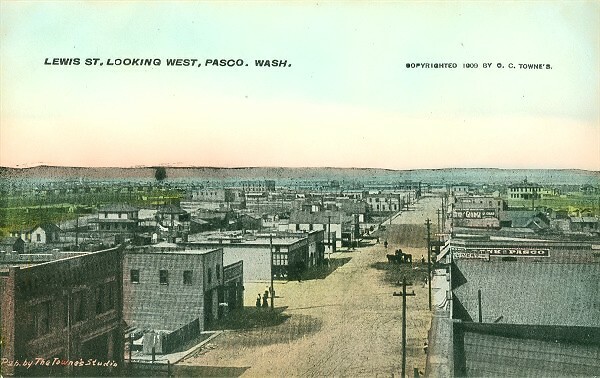 Until World War II, Pasco was the largest and most influential of what were later called the Tri-Cities. In 1943, the Hanford Engineering Project caused both Richland and Kennewick to boom. Pasco, with a Naval Air Station and other military installations, boomed as well, but it soon became known as the oldest and least affluent of the Tri-Cities. It is also became the most ethnically diverse, with substantial black and Hispanic populations. As of 2000, its Hispanic population had reached 56 percent, making it one of the few majority Latino cities in the state. Pasco is now the second largest of the Tri-Cities with a population of about 50,120. The spot where the Snake enters the Columbia was famous for centuries as a tribal rendezvous spot (sometimes called the Grand Rendezvous or the Great Forks). Tribes commonly camped, fished, and wintered from the Snake's mouth upstream on the Columbia for eight miles toward the spot where the Yakima enters. Pasco spreads out today over the eastern bank of this stretch of the Columbia. When fur trader Alexander Ross (1783-1856) came through in 1811, he observed that the forks and the area below were among the most important fishing sites on the Columbia, with salmon weighing 15 to 40 pounds each. Fur trader David Thompson (1770-1857) also arrived at the Snake-Columbia confluence in 1811. He planted a pole in the muddy ground with a piece of paper tied to it claiming the land for Great Britain. He also promised to come back and build a "factory" (trading post) on the site. He never did, because the land was dry, dusty, and treeless -- not prime fur country. When another fur trader, George Simpson, came by in 1825, he described this area of the Columbia as "the most sterile tract of country perhaps in North America." That may explain why white settlement came to the region so slowly. A few ranchers arrived in the 1860s and 1870s, running cows and horses, but for the most part the site of Pasco remained an Indian fishing camp. Captain William P. Gray, who later became a famous steamboat captain and Pasco pioneer, traversed the region on horseback as a young man in 1861 with his mother and two sisters. One night some Indians drove off some of the party's horses. Gray remembered riding into the Indian camp, on the present site of Pasco, and having a harrowing encounter with a group of "Snake River Indians" in a large tent, from which tom-toms boomed. "I decided to put up a bold front and demand the return of my horses," he said in an article written in 1913. "I rode up to the tent, dismounted, threw the teepee flap back and stepped into the entrance. The Indians stopped dancing and looked intently at me. I talked the Chinook jargon as well as I did English so I said, 'Some of your Indians have stolen my horses last night. If they are not back in my camp in an hour after I get there, I'll see that every horse in your camp is shot.' There was utter silence" (Gray). He then rode back to his camp, shadowed by Indians, whose intentions appeared hostile. But when he made it back to camp and sat down to breakfast, all of his horses were driven back into camp within minutes. The history of the city of Pasco actually begins with the history of Ainsworth, a long-vanished town on the north side of the Snake River mouth, only about two miles southeast of Pasco. When the Northern Pacific Railway made plans in 1879 to push through a line from Spokane to Portland, it platted the town of Ainsworth at the Snake's mouth to serve as a railroad construction camp. Before long, Ainsworth was full of workers -- including hundreds of Chinese and Irish laborers -- who were laying track and building bridges. Lumber for the tracks was floated to Ainsworth from the Yakima River to the north and from the Snake and Clearwater rivers to the east. Two Ainsworth sawmills busily cut this wood into ties. Meanwhile, track iron arrived by steamboat up the Columbia. By 1881, Ainsworth had earned a reputation as a wild and lawless boomtown. Spokane newspaper editor Francis H. Cook (1851-1920) visited that year and declared that Ainsworth could boast "a few of the best people, the largest amount of bad men and women and the greatest amount of sin, dust and general disagreeableness of any place of its size on the coast" (Van Arsdol). However, Ainsworth was also a haven of civilization in what was still a dusty and wild tract of frontier. Pioneer Daisy Beach Emigh moved there as a child in 1882 when her father was hired as a millwright. She remembers it as "a scene of much activity" and "the most important town" in a huge section of Eastern Washington. "The great Columbia was our chief source of pleasure,'" she wrote in a 1919 reminiscence. "And while we children boated, fished and waded daily, our big times were the days when father was free to take us in a row boat on a picnic" (Emigh). Once her family was even invited to a wedding dance at the Indian village on an island in the river. At first a steamboat ferried trains -- up to eight railcars at time -- across the Snake River. In 1882, Ainsworth's railroad engineers went to work building a bridge across the Snake near the mouth. Once the bridge was completed on April 20, 1884, the boom town of Ainsworth stopped booming. In early 1885, the Northern Pacific established a new, more permanent, townsite a few miles northwest along the banks of the Columbia: Pasco. Many of the buildings in Ainsworth were dismantled and moved to this new village by February 1885. Several stories exist about how the new railroad town of Pasco got its name. The most likely and most widely accepted comes from Captain William P. Gray, the same man who confronted the Indians in the tepee, who said that the name was chosen by Northern Pacific supervising engineer Virgil G. Bogue (1846-1916). Bogue had recently built a railroad through a place in the Andes called Cerro del Pasco in Peru. The dry and desolate Eastern Washington shrub-steppe reminded him of that high, dry spot. A variation on this story says that the name was chosen for the utter contrast between blazing hot Pasco and that cold Andean village. A third variation says Bogue named Pasco after a Mexican town, a "disagreeable" village called Pasco. A fourth version claims that a railroad engineer couldn't think of a name and happened to glance at a railroad car emblazoned with the initials of the Pacific American Shipping Co.: PASCO. Whatever the origin of the name, the little town was soon well established, with busy railroad yards and a steamboat landing. In December 1885 the state legislature officially transferred the county seat of recently established Franklin County from mostly defunct Ainsworth to thriving Pasco. Pasco has been the county seat ever since. By 1888, Pasco had a noisy railroad roundhouse and busy rail yards. Two steamboats were built in Pasco in 1888, which plied their trade up and down the Columbia and the Snake. Gray captained one of those boats. By the late 1880s, Pasco was already known for being ethnically diverse; it had a small Chinatown near the tracks, with a general store owned by Wong How. On August 29, 1891, the village of Pasco held an incorporation election. Incorporation passed by a vote of 55 to 20, and Pasco was officially declared an incorporated town on August 31, 1891. That same year, a correspondent for the Spokane Falls Review stopped at Pasco, which had a "first-class hotel," several brick buildings, a new Methodist Church, and a fine school with 117 students. He reported that Pasco was an exceptionally well-situated transportation hub, with four railroad lines converging from several directions. "It is evident that the millions of bushels of wheat raised in the Palouse, Big Bend and Walla Walla countries must pass through Pasco en route to tide water," said the paper ("City of Pasco"). The correspondent also recognized that the key to the little town's success would be irrigation. He noted that ambitious irrigation projects were already in the planning stages and he predicted, correctly, that vineyards might one day fill the region. Those irrigation projects were agonizingly slow to be completed, but by 1910 vast acres of the surrounding shrub-steppe landscape were covered with green farms and orchards. Pasco's 1910 population was 2,083 in 1910, up from only 254 in 1900. Pasco in 1910 was nearly double the size of Kennewick and five times bigger than Richland, still little more than a village. The next two decades saw more agricultural growth. The region's early growing season made it especially well-known for asparagus and strawberries. It was also an important tree-fruit region, with acres of peaches, apples, and cherries. Pasco soon sprouted extensive ice-houses and fruit-packing facilities. With all of its railroad and industrial workers, Pasco was a heavily union town. During the labor unrest that shook Washington state during World War I, some Pasco labor leaders were jailed for suspected ties to the Industrial Workers of the World (Wobblies). The town suffered a serious setback in 1919 when a fire raged through downtown, destroying a number of buildings. Some parts of downtown were not rebuilt for two decades. Yet Pasco held its own in many ways, growing to a population of 3,362 in 1920 and 3,496 in 1930. In 1922, a bridge was completed over the Columbia, connecting Pasco and Kennewick for the first time. The Great Depression hit the region hard, depressing agricultural prices. Yet by 1940, the population managed to creep up to 3,913 and an optimistic Pasco correspondent for the Spokesman-Review reported in February 1941 that things were looking up for the fruit, sheep and turkey industries, among others. The new Grand Coulee Dam and other Columbia dams were helping turn the entire Columbia Basin green. The correspondent also proudly reported that nearly all of Pasco's main streets were "oiled during the year," which meant: They were not yet paved ("Keep"). Pasco residents couldn't possibly know they were on the brink of a massive wartime boom. Japan bombed Pearl Harbor on December 7, 1941 and almost immediately, Pasco was jammed with bulldozers, cranes, and men in uniform. In February 1942, the Navy approved the relocation of Seattle's Sand Point Naval Air Station to Pasco. Pasco was chosen for its good flying climate and for its abundance of arid, unused land. By July 1942, a huge air strip was being bulldozed into the sagebrush land right next to town and the streets were "liberally sprinkled with navy blues" (Stark). 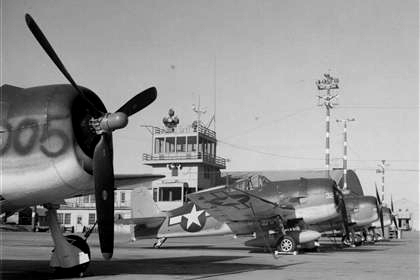 By January 1943, the Pasco Naval Air Station was training hundreds of naval pilots and mechanics. It boasted 70 buildings and a large contingent of WAVES doing office work and technical work. Pasco, because of its central location, also contained an Army depot and a Lend-Lease distribution center. Then, in March 1943, people in the then-tiny village of Richland, across the Columbia, were informed that their entire town was being condemned and taken over by the federal government for a top-secret project at nearby Hanford. Thousands of workers descended on the Hanford Engineering Works in 1943 and 1944. Most lived in hastily constructed housing in Richland and Kennewick, but Pasco caught plenty of the overflow. In July 1943, a Spokesman-Review correspondent reported that Pasco was trying to find beds for a population that had mushroomed to at least 9,000, not counting the estimated 7,500 servicemen at nearby Navy and Army stations. Trailers were everywhere. A room at the New Hotel Pasco could be rented only if the occupant promised to leave the next day. Hotels and boarding houses in the old part of town, near the Northern Pacific station, offered basement cots, lined up dormitory-style. Most cots had different occupants, day and night. Pasco's railroad depot experienced its own boom. In 1940, Pasco's rail passenger receipts averaged $1,000. By August 1944, the average month's take was $350,000. When peacetime arrived in 1945, the wartime boom did not turn to a bust for the region. Hanford continued to be an important part of the nation's nuclear program during the Cold War. By 1950, Pasco's population was 10,228 -- more than double what it was before the war, yet only half the population of Richland, which had mushroomed from almost nothing. Pasco did not harvest nearly as much economic benefit from Hanford as did Richland and Kennewick, but during the 1950s it became a more diversified distribution hub. By 1955, three major petroleum and fertilizer tank farms had sprouted. Pasco also developed an important chemical industry. One enduring result of the wartime boom was a significant increase in Pasco's black population, at least partly because neighboring Kennewick and Richland discouraged blacks from living in its neighborhoods. Kennewick became known as a "sundown town": Blacks were harassed if found on the streets after dark, according to Washington: A Centennial History, by Robert E. Ficken and Charles P. LeWarne. Pasco was more accommodating, although much of the black population was relegated to East Pasco, an area across the railroad tracks that lacked basic services. Housing and job discrimination abounded. Pasco, overall, was slipping behind its more affluent neighbors in terms of income and poverty rate. Yet the black population, which made up about 10 percent of Pasco's 14,522 residents (about triple the state average), was especially poor. In 1960, a group of 22 picketers from the University of Washington's branch of the National Association for the Advancement of Colored People (NAACP) came to Pasco to protest job discrimination in Pasco. They handed out a leaflet which said that not one single black person was employed in a Pasco store, bank, or in a professional position with the city. The leaflet concluded, "No wonder East Pasco is a slum" ("NAACP"). In 1966, the Pasco city manager decried the fact that 28 of the last 38 major crimes had been committed in East Pasco. He said that the railroad tracks divided the city "physically, culturally and economically" and it is "our problem, ours to solve." Pasco voluntarily integrated its schools in 1965, without major disruptions. Yet by the 1970s, another demographic phenomenon had begun to manifest itself. The black population fell from a high of 12 percent to about 7 percent by 1980, while the Hispanic population went dramatically in the other direction. It went from 5 percent to 18 percent in the late 1970s, fed by waves of farm workers who originally came up from Mexico for the fruit harvests and fieldwork in the Yakima and Walla Walla valleys. The Tri-Cities, as the area was now known, suffered an economic setback with two staggering blows at Hanford in the 1980s: The cessation of construction on the Washington Public Power Supply (WPPS) nuclear energy plants, followed by the closure of the federal plutonium facilities. In an effort to boost their economies, residents of the three cities voted in 1985 on a plan to consolidate the Tri-Cities into a single municipality. Richland residents voted overwhelmingly in favor, Kennewick voted no by a small margin, and Pasco, by then the smallest of the cities, voted no by an overwhelming margin. The proposal failed. The issue was complicated by the fact that Kennewick and Richland are in Benton County, whereas Pasco is the county seat of Franklin County. Kennewick and Richland tried again to consolidate in 1988, leaving Pasco out of it. That effort failed, too. The three cities remain officially separate today, although they are branded together for marketing purposes by the Tri-Cities Visitor and Convention Bureau and the Tri-City Regional Chamber of Commerce. Pasco experienced a significant population boom in the 1990s and 2000s, consisting largely of Hispanic residents. The Hispanic population of Pasco exploded to 56 percent in 2000, compared to 7.5 percent statewide. The superintendent of the Pasco School District told the Associated Press in 2007 that 65 percent of the district's students come from homes where English is not the primary language. Franklin County, in 2006, became the first majority Hispanic county in the Pacific Northwest, according to the Associated Press. Pasco's black population, meanwhile, dropped to 3.2 percent in 2000, exactly at the state average. Pasco remains an important transportation center, and has extensive industrial and agri-business facilities. The Port of Pasco took over the old Army depot in 1959 and now operates it as the Big Pasco Industrial Center. The Port also took over the old Naval Air Station facility in 1963 and runs it as the Tri-Cities Airport. Columbia Basin College, a community college that began in 1955 in temporary quarters on the naval base, now enrolls about 7,000 students a quarter on its own campus on Pasco's north side. Pasco also boasts several wineries. The estimated population of Pasco in 2007 was 50,120, making it the 18th largest city in the state and the second largest of the Tri-Cities, after Kennewick. The Tri-Cities metro area was estimated at 224,800 in 2006. Meanwhile, Ainsworth exists only as a ghost town, mostly covered by the dammed-up Columbia. Yet a few miles up the river, Pasco, true to its roots, still bustles to the sound of the railroad locomotive and the river tug.